It seems a little crazy to be posting a sweatshirt right now. Even though we’re over halfway through September (oh my god, how are we halfway through September), it’s still 95° F/35° C here in St. Louis. Admittedly, that’s out of character for this time of the year, but even last year at this time it was probably in the 80s! But really, I’ve been wanting to share this sweatshirt with you guys for a looooong time. 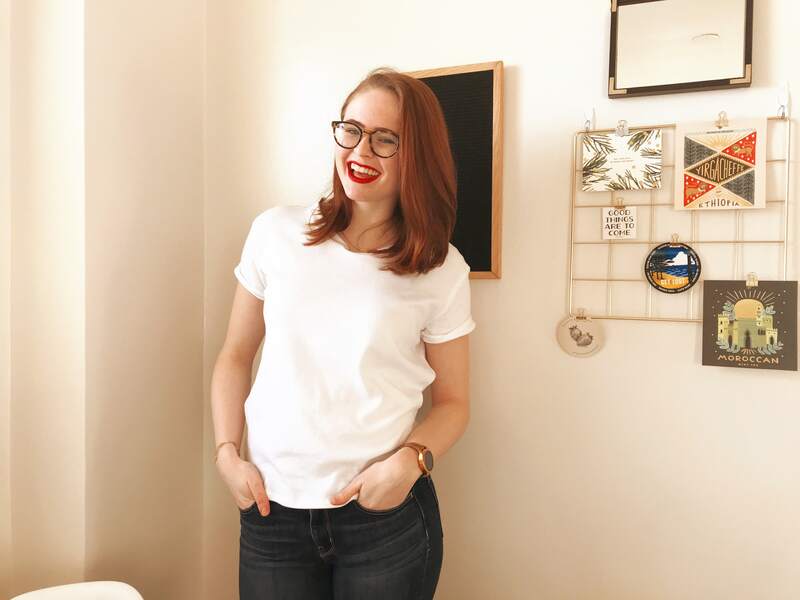 It’s the brand new Ali Sweatshirt from Sew DIY, and I was lucky enough to be a pattern tester! The Ali Sweatshirt is an adorable drop-shoulder sweatshirt. It’s incredibly simple, which makes it a perfect choice for beginner sewists AND more experienced folks looking to hack things! I can see so many amazing variations for this sweatshirt. It’s sure to be a staple in your pattern catalog. I made my sweatshirt in a size small, my usual Sew DIY size. I did not make any #sewingtall adjustments, but I could use another inch in the sleeves. The Ali Sweatshirt is meant to be somewhat cropped — the description says it hits at the high hips. If you like a longer sweatshirt, keep in mind that you will need to add length. My Ali Sweatshirt is made in a plain black sweatshirt fabric from JOANN. It is not fleece backed because even the thought of trying on a sweatshirt was making me sweat when I bought the fabric! As far as sweatshirt fabric goes, this is pretty decent. It’s thin, which makes it a great weight for St. Louis’s warm fall weather. If you’ve ever made one of Beth’s other patterns (like the Lou Box Top or Lou Box Dresses), you’re familiar with her clear instructions and illustrations. She makes sewing so accessible to new sewists, and this pattern is no different. It’s easy to follow along with her method, although more advanced sewists will likely find that they don’t need the instructions at all. Regardless of skill, you could easily whip this sweatshirt up in an evening, and definitely on a Saturday or Sunday. I actually sewed my entire Ali Sweatshirt on a straight stitch with a single needle — not my beloved twin needle! This is because I wanted to replicate a design feature I love in a few of my RTW sweatshirts. I sewed the seams at the shoulders and sides with the right sides together, instead of the wrong. Then I trimmed the seam allowance down pretty close to the stitch line so that there’s a fairly stiff edge at all of those seams. It’s an easy little switch that I just like the visuals of. I also added a quote to my Ali Sweatshirt! I actually made this way back before I went to Italy, so I was working on learning all of my key phrases. 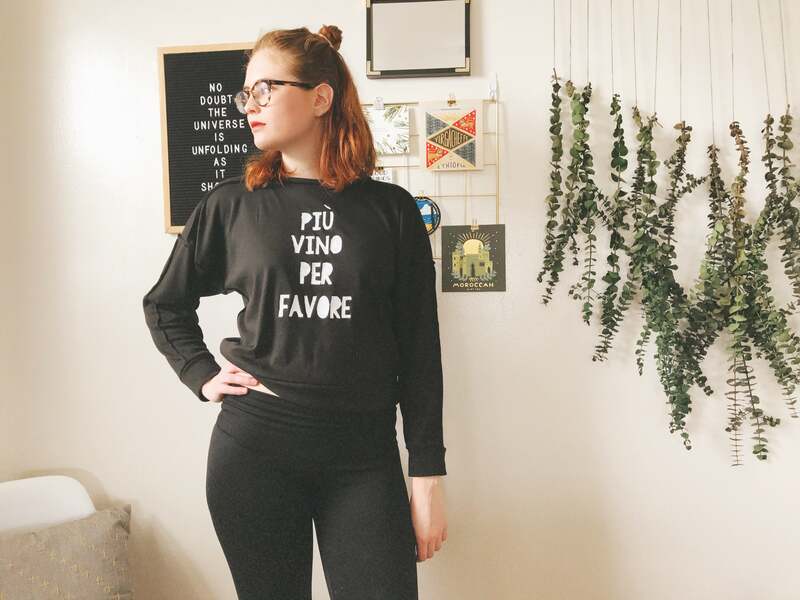 Using my freezer paper stencil trick, I painted “piu vino per favore” on the front, or “more wine please”! Thank goodness I put the time into learning that phrase, it came in so handy. So there it is — the Ali Sweatshirt. Unsurprisingly, it’s another winner from Beth. Go grab yourself a copy now! I really like the exposed seam allowance, what a fun design feature! Thanks Nichole! It’s so easy, too! Wait, do you mean you sewed them with wrong sides together instead of right? Ah good catch haha! Yes, the wrong side!